The EZQuest Adobe Photoshop Keyboard Cover will be a valuable tool for those Adobe Photoshop CC artists who are not at the extremes of the learning curve. 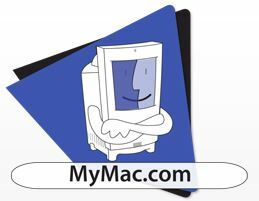 Since 1995, MyMac has published all things Macintosh-related. To read the entire review, visit EZQuest Adobe Photoshop Shortcuts Keyboard Cover – Review. EZQuest’s Photoshop Shortcuts Cover is the perfect accessory for Photoshop users who have not yet memorized all their favorite shortcuts or students new to Photoshop. Made of high-quality, silky-soft silicone, the cover slips onto your keyboard and stays put. There is no slippage and typing is not affected. Other products on the market offer expensive keyboards specifically designed for using Photoshop or stickers, which are inconvenient and messy. EZQuest’s shortcuts skins use a heat-infusion technique that prevents chipping and cracking. Another benefit is the protection it provides your keyboard from spills, dirt and dust. 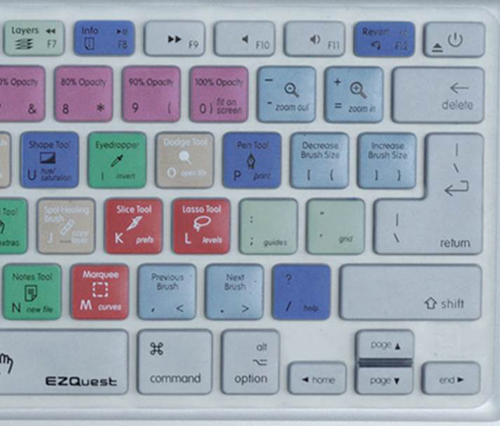 Closeup of EZQuest’s Photoshop Keyboard Shortcuts Cover. For faster delivery, order your keyboard shortcuts cover from BestBuy. If you’re just looking to protect your Mac keyboard, consider our clear invisible and our Color Expressions! keyboard covers.